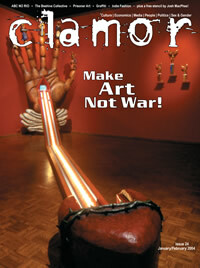 The Clamor Magazine Collection has recently been cataloged in the Internet Archive. 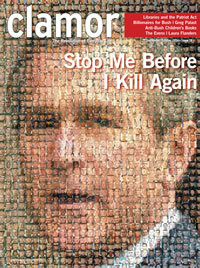 Clamor was a fantastic magazine, and the archive is a great view into the intermingling of the global justice movement and the anti-war movement in the post-9/11 era. 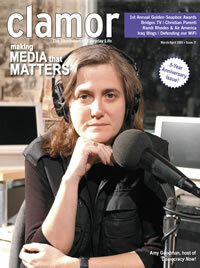 The magazine was founded in 1999 and came to an end with its final issue in the Fall of 2006. Jen Angel released an analysis and reflection of the project called “Becoming the Media: A Critical History of Clamor Magazine” that has been published by PM press. I did a number of illustrations and reviews for the magazine from 2003 through 2006. It was a fantastic publication to have a small part in, and I met so many great people and was introduced to so many amazing projects that were associated with the magazine or revolved in the same circles. It is sad it had to end, but now it lives on in the Internet Archive!